When Mark Buzzetto took a casual part-time job at Four Seasons Flowers in Mount Kisco 40 years ago, he could never have imagined that he would return one day to be its owner. Mark Buzzetto, the new owner of the Four Seasons Flower Shop in Mt. Kisco, right, with his son, Mark Jr.
As a teenager, the village native was eager to find a job where he could make some extra money. He found it at Four Seasons delivering flowers, which at the time was owned by Frank Yozzo, his uncle’s best friend. Buzzetto, who had previously owned the Brewster Flower Garden for 30 years and recently sold it, recalled the wealth of experience he gained as a young man under the watchful eyes of Yozzo, who retired last year. As a result, the 59-year-old Buzzetto acquired a true passion for the floral business, as well as a natural ability to design arrangements, all because of Yozzo’s supervision and training. “I loved it, and he trusted me,” Buzzetto said, referring to the close relationship that was formed between them. Buzzetto said that Yozzo eventually encouraged him to go out on his own, knowing that he had conscientiously practiced his craft long enough and had acquired the knowledge to start his own business. In 1988, Buzzetto took a risk when he purchased the Brewster Flower Garden in a community he knew little about. “All I knew was that I wanted to make something of myself,” he said. 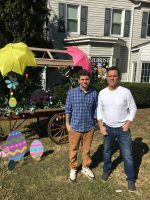 Buzzetto, who is married to his wife Vittoria, a teacher at Fox Lane High School, is excited to be running Four Seasons Flowers with the help of his 28-year-old son, Mark Jr. He also has another son, Benny. Serving Mount Kisco, Bedford and beyond, Buzzetto offers all you would expect in a well-stocked flower shop. The 1,000-square-foot store provides plenty of room for him to create a multitude of modern and traditional flower arrangements for all sorts of celebratory events, as well as funerals. Four Seasons Flowers also offers silk and dried flower arrangements. Buzzetto routinely delivers arrangements and gourmet fruit baskets to the nearby Northern Westchester Hospital. Customers can also order gift baskets at the store or through Teleflora. A number of seasonal plants are sold as well. Compared to the commute he once had, Buzzetto is thrilled to run a business that is within walking distance of his house.